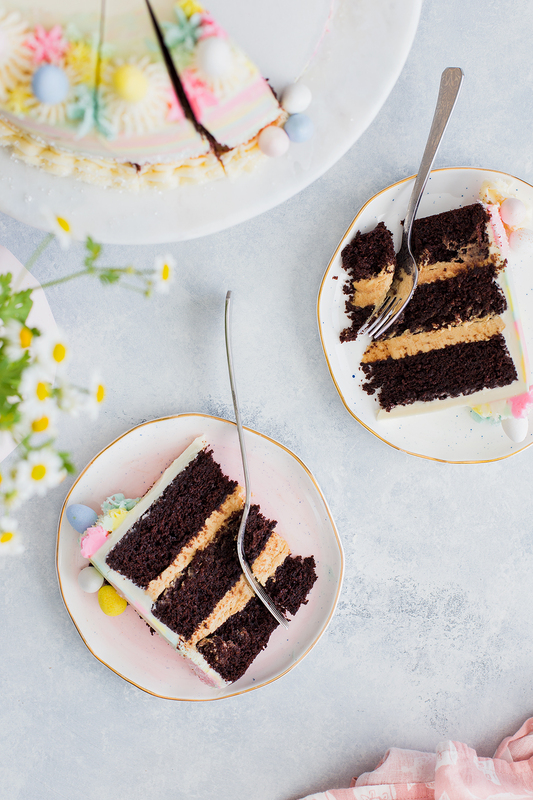 A week or so ago I did an Instagram poll asking what everyone would like to see for Easter–cake or pavlova–and cake won by a decent margin, so here we are! 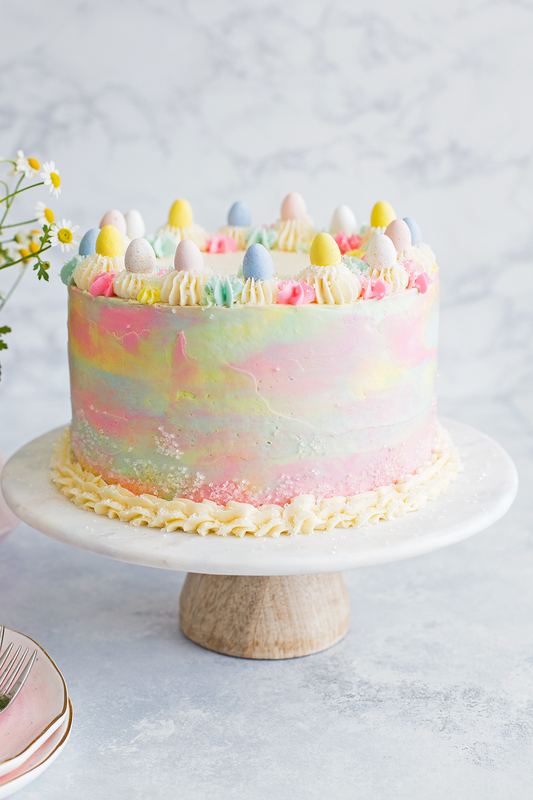 I modeled this cake after my favorite Easter candy, Reese’s eggs, and topped it with my second favorite Easter candy, Cadbury mini eggs. 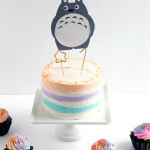 The cake is made of three moist layers of chocolate malt cake sandwiched with a fluffy + rich peanut butter filling and frosted in a crazy-pastel watercolored vanilla malt swiss meringue buttercream. 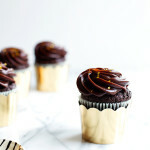 The combination of flavors is just as delicious if not more than I envisioned in my head and will be a total hit with the chocolate and peanut butter loving people in your life. Even though the result is a little crazy, in my opinion, it’s super fun and festive for spring holidays. Side note: My mom was here visiting for the holiday and acting as my assistant when I was photographing this cake and even though pb+chocolate aren’t her faves, she loved this and ate a whole slice immediately after the shoot (and sent snapchats of it to all her friends, lol)! 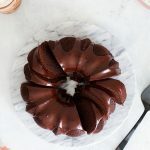 The components of this cake come together easily, the cake is a 2-bowl situation and while the frosting can take some finesse, it’s all totally doable and worth it. Layer cakes can feel like a whole process and they are! Not that it’s a difficult process, but they do take some time and patience. I suggest breaking up the steps over 2 or 3 days. It makes it all much easier and less stressful. I always, always, ALWAYS, chill my cakes between assembly steps. Especially after crumb coating. This makes it so much easier to keep the cake from becoming slanted and for icing it with the final layers of frosting and any additional decorative touches. On that note, to get those super-sharp, picture perfect slices, I also chill the entire cake until very firm (usually overnight) and use a sharp knife dipped into very hot water and dried on a towel for each and every cut. 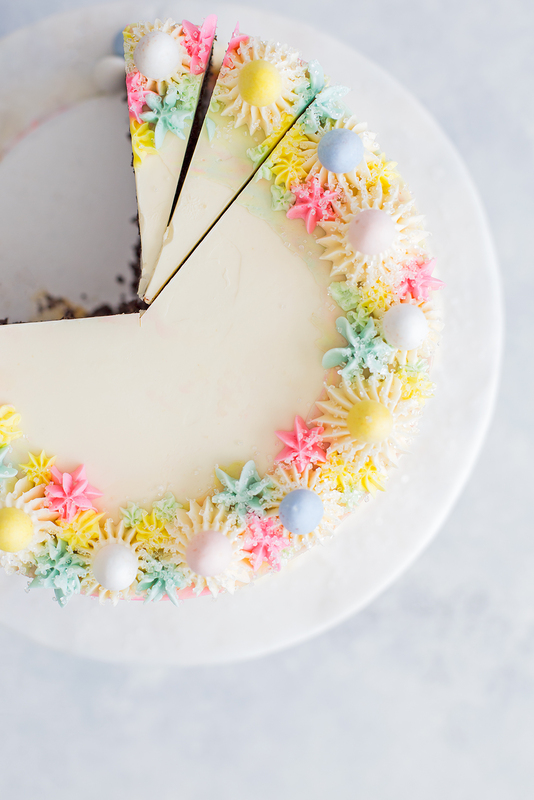 An offset spatula is your friend when decorating cakes! I have a variety of sizes and use them for everything from frosting cakes to spreading batters to slathering butter onto our morning toast. They are worth the small investment. I always use a cake turntable when making layer cakes. 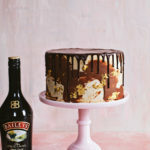 It makes an enormous difference in executing a smoothly frosting cake and keeps stress levels down. There are a few versions out there from very affordable to more expensive. I have used a plastic Wilton version purchased years ago with Michael’s 40% off coupon that has been a champ. More recently I invested in a heavier duty Ateco brand one, that I love as well. Find one that fits your budget (or use a lazy susan in a pinch). Three dark chocolate malt cake layers sandwiched with creamy, whipped peanut butter filling and frosted with pastel vanilla malt flavored swiss meringue buttercream. Preheat the oven to 350°F. Spray (or butter and flour) three 8x3-inch round baking pans with baking spray and line with parchment rounds. In a large mixing bowl, whisk the flour, sifted cocoa powder, malt powder, baking powder, baking soda, and salt together. In a large (4-cup) measuring cup or spouted bowl, whisk the sugar, buttermilk, canola oil, eggs, and vanilla together until combined. Beat the liquid mixture into the flour mixture until just combined into a smooth batter. Divide the batter evenly between the prepared baking pans (you will have about 1590grams of batter, so 530grams per pan). 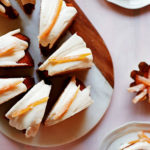 Bake the cakes on the center rack of the oven for 25-28 minutes, or until a toothpick inserted into the center of the cakes comes out clean and the tops spring back to the touch (if you can fit them all on the same rack without touching the pans together, that is ideal). Cool the cakes completely on a wire rack before filling and frosting. You can wrap the cakes well in plastic at this point and freeze or refrigerate until ready to assemble. Beat the softened cream cheese in a mixing bowl until smooth and creamy. Beat in the peanut butter, the mixture will likely clump up at this point, but will smooth out. Beat in the condensed milk, followed by the softened butter and a pinch of salt. Beat until smooth and fluffly. In the bowl of a stand mixer, combine the egg whites and sugar. Bring a saucepan (one that will cradle the mixer bowl without allowing the bottom of the bowl to touch the water) with a few inches of water to a simmer. Set the mixer bowl over the simmering water and continuously stir the mixture until the egg whites are hot to the touch and the sugar has dissolved. To test the temperature and if the sugar has dissolved, dip a finger into the egg whites and rub between two fingers--if there are no grains of sugar, you are good to go. Fit the mixer bowl onto your stand mixer and, using the whisk attachment, beat on medium-low speed until foamy. Gradually increase the speed and beat until you achieve a stiff peak that droops only slightly, and heat no longer escapes from the top or bottom of the bowl. Using the paddle attachment, beat in the butter at medium speed, a few tablespoons at a time, waiting until each addition disappears into the meringue. The buttercream may look curdled at a point, but keep mixing! It will smooth out. Once the buttercream comes together, beat in the malt powder and vanilla. Beat for an additional 2 minutes to combine completely, scraping the bowl as needed. Turn the mixer to the lowest setting and beat for several minutes to collapse some of the air bubbles so your frosting is smooth. Use or color immediately, or store in an airtight container in the refrigerator until ready to use. If you refrigerate, bring the frosting to room temperature and beat in a mixer on low until smooth and creamy before using. To color the frosting, I like to dissolve food coloring gel in cream and beat in gradually to the frosting until I achieve my desired color. To decorate as shown, scoop about 1 cup of the prepared buttercream into 4 separate bowls (1 cup per bowl) and color with pink, blue, green, and yellow food gel. Leave the remaining buttercream un-colored. 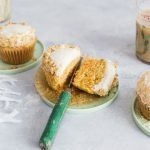 Frost the crumb-coated cake in an even layer of the remaining un-colored buttercream. Randomly dot the entire sides of the cake (and top, if you want) with the colored buttercream. Using a bench scraper or large offset spatula, smooth out the colors, while turning the cake to achieve a watercolor effect. A cake turntable or lazy susan will help with this process. 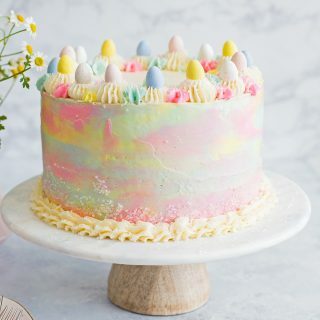 Pipe the remaining buttercream around the top and bottom edges of the cake with a variety of star tips and sprinkle with sanding sugar and top with chocolate egg candies. This post contains affiliate links (though it is not sponsored). This just means any item purchased after viewing one of these links may result in a small commission for this blog which will be used for site maintenance and more ingredients/tools to continue to bring recipes for your eyes and bellies. Thanks! This is beautiful Cindy! Your cakes are always a work of art. I would happily gobble this one up. i actually passed out reading this post…all my favorites and SO gorgeous!!! This cake reminds me that I still haven’t visited you yet. I really, really need to make a trip soon! I absolutely LOVE the colors of the cake.